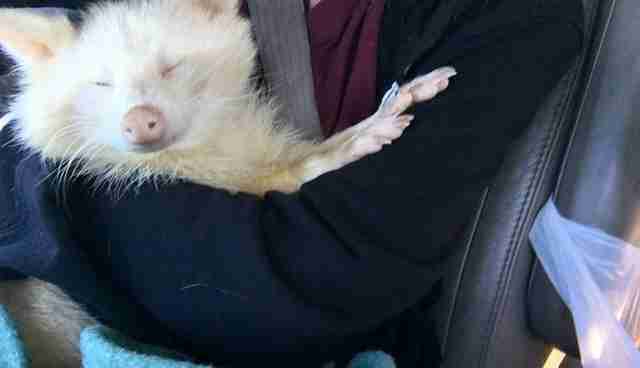 "All it took was a couple scratches on the head and she completely attached herself to me." 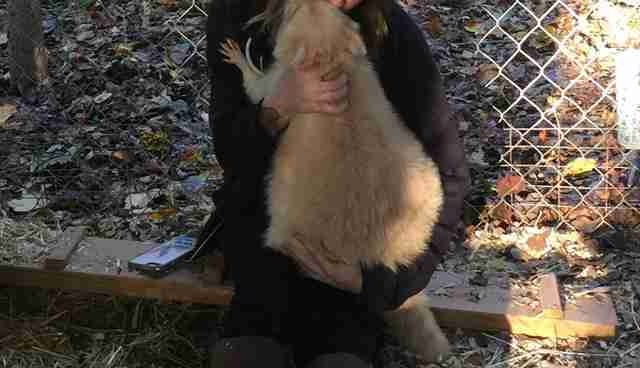 The raccoon was aggressive, unable to be touched and certainly not able to be handled. At least, that's what staffers with the Georgia Department of Natural Resources (DNR) told Maxine Baird, founder and director of A New Hope, an animal sanctuary in Georgia, when they asked if Baird would keep a former captive raccoon earlier this week. For legal reasons, the DNR didn't provide many details about where the rescued raccoon came from, but Baird was told that she'd been kept in "horrific conditions." 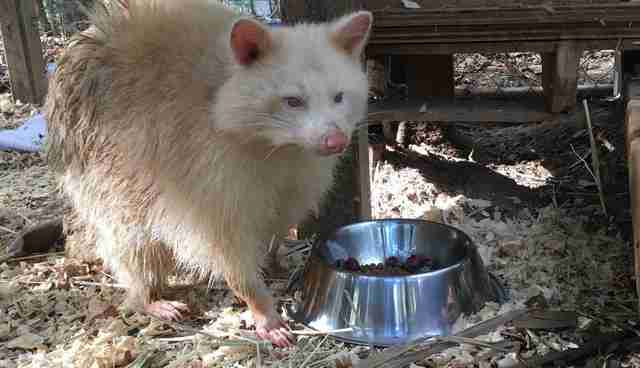 The raccoon had albinism with stark white fur and a pink nose and ears. She was about 4 years old, and according to the DNR, she'd spent the majority of her life locked up in a tiny, suspended wire cage. 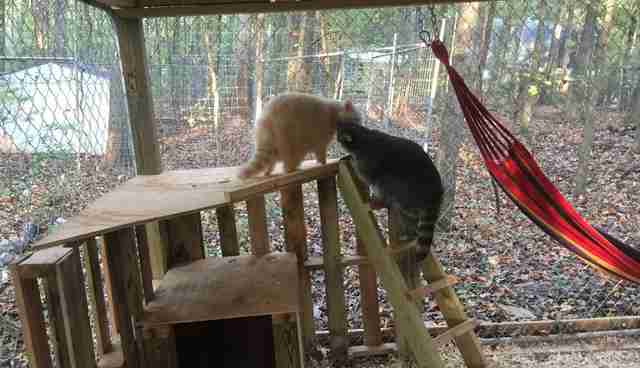 While the details of the raccoon's rescue have remained vague, Baird knew that the DNR had worked for months to rescue this raccoon and other animals from the previous owners, including a tiger and a coatimundi. 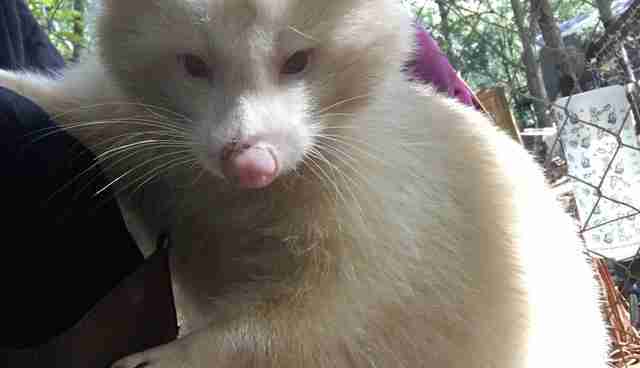 Baird doesn't know for certain, but, according to the DNR, the animal's original owner intended to use the raccoon for taxidermy. "[The DNR officer] initially just asked us to watch her temporarily while he found placement for her," Baird told The Dodo. 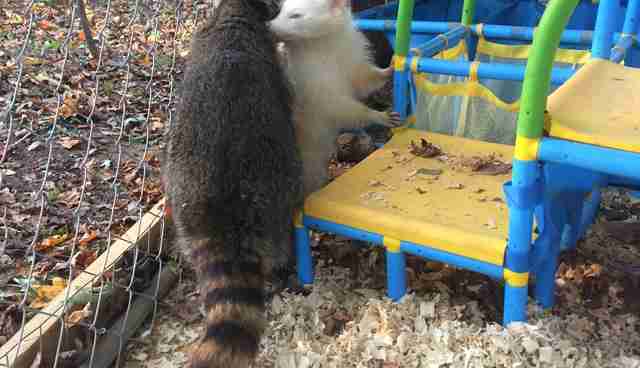 "We only have one raccoon enclosure [at A New Hope], which has another raccoon in it. 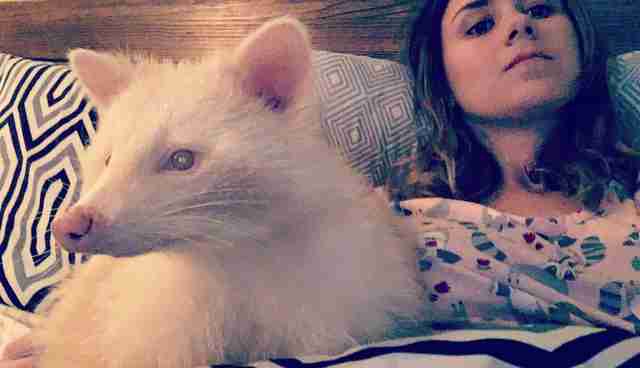 But since she was described as so aggressive, I assumed that they probably wouldn't get along, so we were just going to hold her for a couple of days." When the raccoon arrived at A New Hope, she was pretty scared and standoffish, and didn't want anything to do with people. But she didn't seem "aggressive" to Baird. 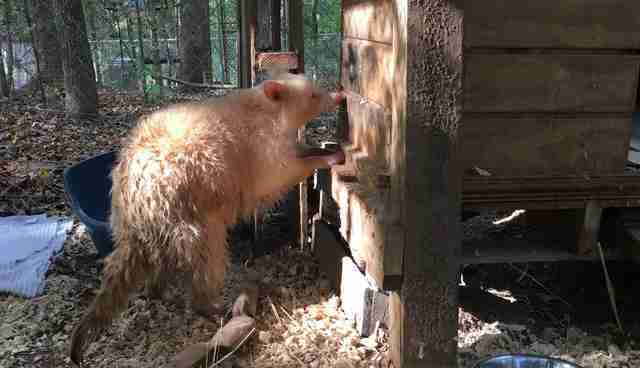 The main thing Baird noticed was the raccoon's poor physical condition. "She smelled horrific," Baird said. "I mean, she smelled so bad. She was covered in feces, urine - so much to the point that she had urine burns all over her rear and stomach. She's got a lot of hair loss. She's also very obese. She weighs 22 and a half pounds when, based on her size, she should probably weigh around 16 pounds." 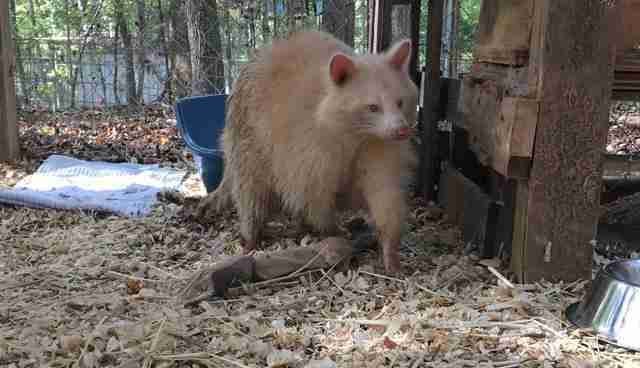 The raccoon also had sores all over the pads of her feet, which are the most sensitive parts of a raccoon's body. "The officer who delivered her said he doubted she'd ever had her feet on solid ground before," Baird said. "This was especially sad because raccoons are sensitive in their hands - it's one of their most dominant senses. Her sores must be pretty excruciating." ... and something magical happened. "I don't know - we just had a really good connection," Baird said. "I'd been going through some stuff in my personal life, and I was kind of having a sad day, so I went out there, and I sat by her and she came right up to me. And it was interesting because she hadn't come up to anyone yet, and she came up and sniffed me, and put her little hands in my hand. Ever since then, she's been honestly the sweetest raccoon I've ever met in my life, and I've raised probably 200 raccoons." Baird named her Isis after the Egyptian goddess who was known for her kindness and compassion. 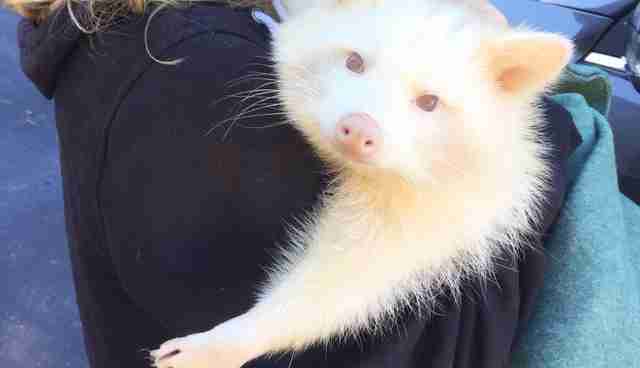 "Since this little raccoon has been through so much and is still so sweet, we found it fitting," Baird said. A vet examined Isis and advised Baird to keep her inside Baird's house while her sores healed. Isis didn't seem to mind at all. "She's so gentle, she's so loving," Baird said. "She spent the last couple days glued to my side, sleeping on my lap, having me carry her around, cuddling, giving me little kisses. I just saw a complete 180-degree flip in her personality the minute she was exposed to some kindness. All it took was a couple scratches on the head and she completely attached herself to me." Isis loves going through Baird's pockets, finding things like keys and cell phones. She also likes play-wrestling with Baird and climbing anything she can. "I don't think that's something she's had the opportunity to climb before," Baird said. "You can tell by her overall clumsiness that moving is a totally new experience." 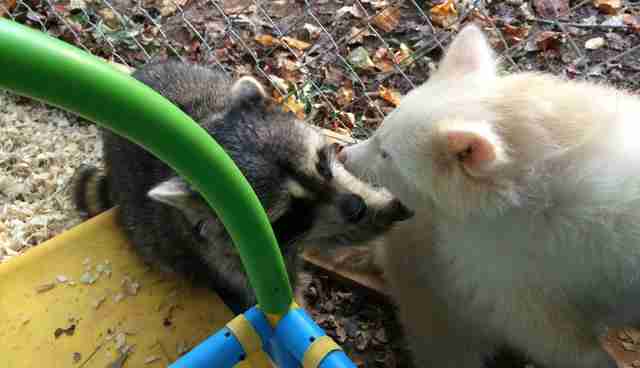 She also made her first raccoon friend - another rescue raccoon named Ghost - during a supervised play date. But what Isis loves more than anything is hanging out with Baird ... and cuddling. As cute and cuddly as Isis the raccoon is, Baird is quick to point out that people should NOT keep raccoons as pets. "Raccoons can be incredibly destructive, and they can get very aggressive, and they really, really don't make good pets," Baird said. "A lot of the animals we have at the sanctuary are relinquished pets." Baird also explains that while Isis is living inside with her now, she'll eventually go back outside to live in an enclosure with other raccoons. 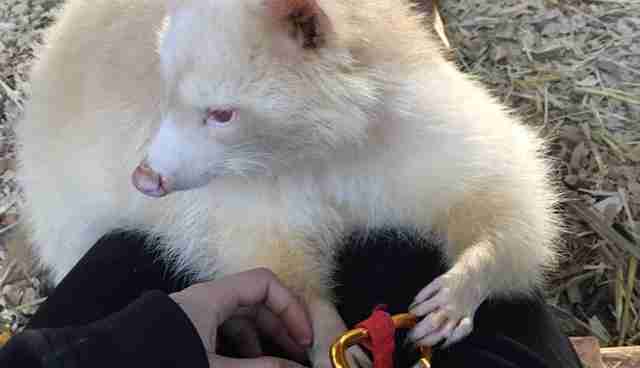 "She is a pretty incredible animal, and it's pretty amazing to see her cuddling and giving kisses and being sweet, but that is not normal, not natural, and it's really not that good," Baird said. "If she hadn't been in an abusive captive situation, then she'd be out in the wild, and that's what we would really want for her – it's just not going to be a possibility because of what she's been through." 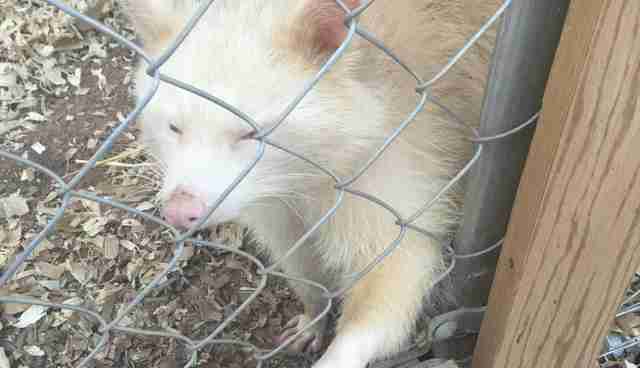 A New Hope: Animal Sanctuary and Education Center is a nonprofit organization that rescues and rehabilitates wildlife and farmed animals, as well as animals from the exotic pet trade. To support this sanctuary, you can donate here.